To Stow your Stowboard press the red release button towards the front. Release the front key from the front of the metal deck. First fold the front end (with the big wheels) up and into the metal platform. Finally fold the tail up and into the platform. To unstow simply perform these steps in reverse. How to Stow the Stowboard! 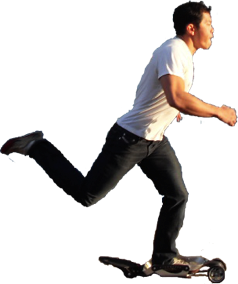 How to Ride the Stowboard! Ride the Stowboard almost exactly like you would a skateboard or a scooter with no handle bars.. But better! 3.Push off with the other foot to get rolling. 4.Once rolling you can rest your back foot on the black rear platform for added steering and control. To turn simply shift your weight in the direction you want to turn. -hold the board on the front support beam closest to you with your left hand and the tail with your right. -Then press the red release switch to the front of the board with your right thumb. -Then fold the back module up and in a little. -Then release the front key by pressing up on the key-piece with the middle finger of your left hand. To unstow the Stowboard do the process in reverse. Many but not all of the normal tips for skateboarding apply. 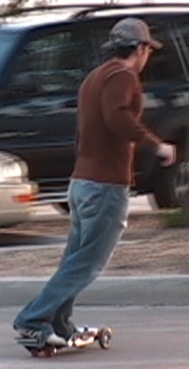 Skateboarding and Stowboarding are potentially dangerous activities. All precautions you’d take when riding a skateboard you should take while Stowboarding. Just because it’s a smooth fast ride that provides a low center of gravity and conveniently folds up when not in use doesn’t mean you can’t get totally jacked up if don’t respect the fact that you’re rolling on wheels. -NEVER skate without wearing sturdy closed toed shoes. -Always be able to “run off” if you need to bail. In other words, keep your feet under you! -When going over rough spots or large cracks in the pavement try to have your pushing foot pushing (or at least ready to take over) at that moment, this way if you get stuck on some debris you won’t go flying because you’ll have your pushing foot down. 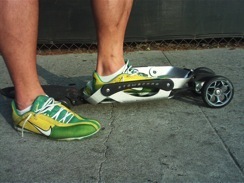 -Never skate or ride your Stowboard in the rain or on wet or sandy ground. This can unexpectedly decrease your traction and you might power slide when you least expect it. Plus, water and sand are bad for bearings.